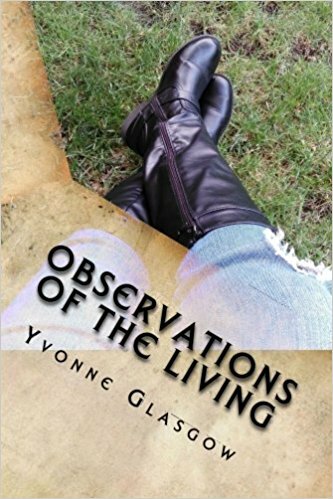 Yvonne Glasgow is a blogger/writer (IAPWE-certified), self-published author, and poet. 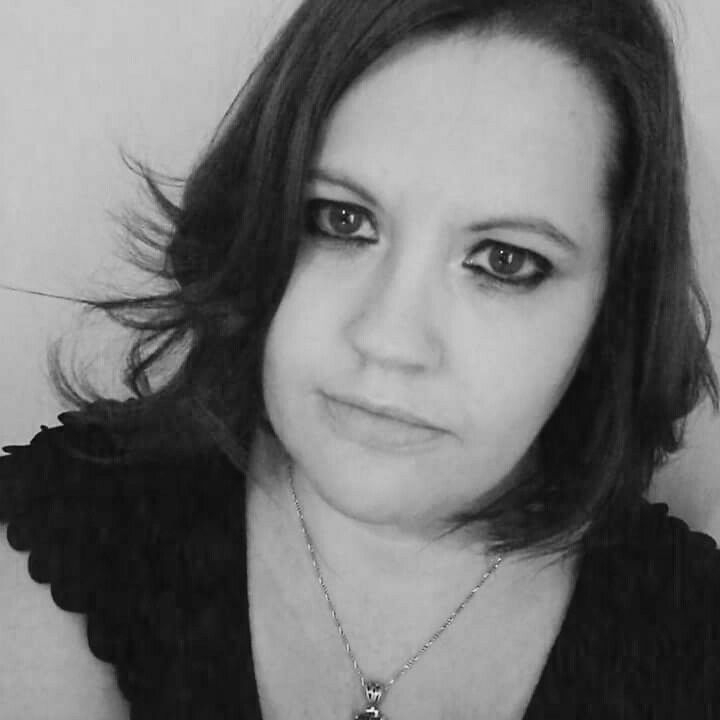 She has been working as a freelance writer since 2000, and has had her works in print and all over the internet. In 2008 she decided to write and do the art for a children's book, which is now out-of-print. Since then she has self-published numerous books, with three currently in print. Yvonne has a Ph.D. in Holistic Life Coaching, is a certified Metaphysics practitioner/ordained, and is currently working toward a D.D. in Spiritual Counseling. When she's not writing she's creating arts and crafts and helping aspiring writers find their voices. I am a creativity addict. Writing is my number one passion, but I also love to create using more than just words. I am even working on creating my own tarot deck using mixed-media collage art. When I am not writing or crafting I am usually at one of my boyfriend's gigs. He is a career musician that plays all over the state of Michigan. If you like rock, folk, country, and anything in between, look up Dale Wicks online. I love writing, I love music, and I love art. I also love occult and new age topics. I use crystals for healing and I consult Runes and tarot cards when I need answers to the questions life throws at me. In September I released a new self-published book, wanting it out in time for Halloween. It's something that would be fun to read the whole year round though. 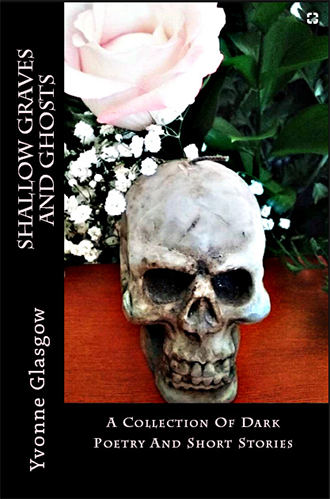 Shallow Graves And Ghosts is a collection of spooky short stories and poems. It has ghosts, goblins, vampires, and more within the pages. This was my third book this year. After leaving a bad marriage in March of 2016 I struggled to get back on my feet. 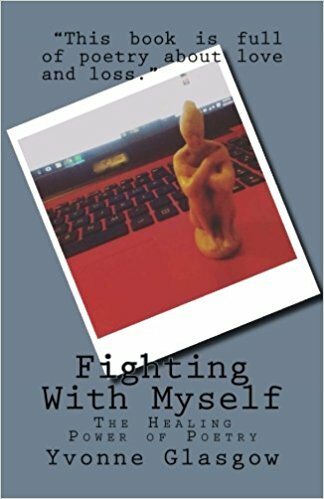 Fighting With Myself- The Healing Power Of Poetry was my way to get through the bad stuff. It's a poetry book, but I opted to put my explanation for each poem after them so that people could understand where it was coming from. I did it as a way to help other people feel less alone when they're going through abusive and negative relationships and suffering anxiety and depression. I published a follow up to this, Observations Of The Living. This one is all poetry, no filler. In first grade our teacher had us write a book, which we then bound and made a cover for (gluing material to cardboard). Mine was a poetry book. After that, I continued writing poetry. Then I “graduated” to writing short stories. My career as a writer didn't get its start until early (very early) 2000 when I started writing concert reviews for a local magazine. This led to a steady stream of CD reviews for them up until I was hired as their editor in 2003. Unfortunately, the magazine sold in 2005 and we were all replaced. After that, I started writing online, out of necessity. And the rest is history. I started calling myself a writer after I got my first review published in 2000. Prior to that, I called myself a poet. Once I published my children's book in 2008 I was thrilled to finally be an author. I was camping with a former boyfriend when I got my inspiration for Frankie The Firefly Belongs. I was inspired by the fire and by the stars, and by nature in general. It would be a few years before I finally got the guts to reach out to a publisher and get it into print. Fighting With Myself has an obvious message. I wrote it in the hopes that it would help other people going through the things I've gone through, and let them know that they can make it past the hard parts. No one ever said life was easy, but sometimes it feels like it is harder than it needs to be. Even if you grew up with abusive parents, like I did, you can still make something good out of your life. You don't ever have to just be what someone else says or thinks you are. My two poetry books are all about my life and my viewpoints on things. In Shallow Graves And Ghosts you'll find mostly fictional tales about ghosts and vampires. However, in both “Story Of A Haunted Girl” and “Was It Just A Dream?” you'll find a couple stories that are based on truth, written as fictional stories. The first is a story about the haunted house I grew up in, the other is about a night terror I suffered one night. The poems are about love and loss, and all things that come with those experiences. Each poem is complimented by a synopsis explaining the story behind its words. Much like my need to read more than one book at a time, I also have numerous writing projects going on all the time. I have a Michigan-inspired poetry book I'm working on slowly, and some children's books I really would like to get around to creating (I always do my own artwork). However, my most important projects, which I plan to get done first, are a couple self-help books. They are Reconnecting With Yourself and The Jealousy Remedy. The first is a guide to finding the true you again when you've been lost, no matter what got you lost in the first place. The other is a guide to dealing with jealous people and getting over those pangs of jealousy we all feel from time to time. Writing is most definitely my career. I work from home now, full-time, as a freelance writer. Right now I have a gig that pays me to write music reviews, and I have one that pays me to write about chakras. I love what I do and wouldn't change a thing about it. I would, however, love to be an author for a living. I'd still do my freelancing, but I would love to make a name for myself as an author. That's something I am really hoping to do with my self-help and health & wellness books, once they are in print. My mom was a reader. She pushed me to read and reading inspired me to write. I've always had a creative imagination, so it makes sense that I took up writing as a career. I design all of my own book covers. I also take great pride in the fact that I use my own art and photography to create them. I want my books to be complete extensions of myself, so using photos from a source like Pixabay is something I'll never do. I know lots of writers use such sources, but I prefer that my work remains all mine and that I can be seen in what I've created, right from the front cover. Scheduling the time in a normal life to complete an entire book is always the hardest part for me. I write for a living, so there are some days where I just don't want to write anything at all. Once I get a little time away from my computer I get refreshed and motivated again and can get back to business. I've yet to delve into the amazing world of fiction novel writing because I find it hard to keep a story going long enough to make a complete book. Short stories come easy to me, but I hope to create a full novel someday. Write every single day. Write about life, write about your dreams, and write what is in your imagination. Start a blog or write in a notebook. Don't be discouraged from submitting articles to magazines or from self-publishing if you can't find a publisher. If you're not really good, keep writing to hone your craft. Take some writing classes, join some social media groups with other writers and authors and don't be afraid to ask for tips. And, ALWAYS read through what you've written before you share it in any way. It's the only way to really catch all the errors. Spell check isn't the answer to all mistakes. I hope that my work inspires you and helps you get through this thing we call life. I love to make art and I love crafting. Aside from that, music is a passion of mine and I have been learning to play the piano, ukulele, and harmonica. I don't know if I'll ever play any of them outside the house, but it's fun to learn. I also love to hike. Going for walks is a great way to fight depression and boredom. I also get a lot of my best ideas while I'm walking. And, on top of all of that, I've been working on my fortunetelling skills. When I was in high school I really wanted to become a high school counselor. One semester I worked in the counselor's office and I really loved it. I think that is one of the things that pushed me to be a self-help writer and get my degree in life coaching. At this point, I wouldn't trade in what I do for any other career. Instead, I find ways to pursue those other passions with my writing as the catalyst.